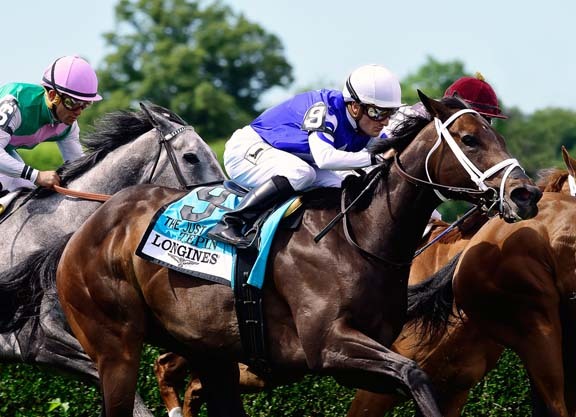 Tepin (Bernstein) has been invited to compete in the G1 Queen Anne S. at the Royal Ascot meet, an invitation owner Bob Masterson is eager to accept. The invitation came after the 5-year-old mare kicked off her 2016 campaign with an easy win Saturday at Tampa Bay Downs in the GIII Endeavour S.
Trainer Mark Casse said after the Endeavour that Tepin may have one more start before one of her main goals for the year, the GI Maker’s Mark Mile Apr. 15 at Keeneland. The Maker’s Mark is looming as her first test against males this year and her first against the boys since she won the 2015 GI Breeders’ Cup Mile. The Breeders’ Cup win helped Tepin wrap up an Eclipse Award as the nation’s leading turf filly or mare. The Queen Anne is also open to males and is contested at Tepin’s preferred distance of one mile. The race is the first on the opening-day card of Royal Ascot. In 2015, its purse was worth roughly $541,000. Masterson said he has already mulled his options concerning jockeys and will stick with French native Julien Leparoux should Tepin go to Ascot.